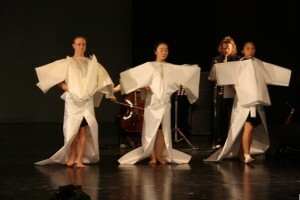 The Bow Project was borne out of affiliations created during the Asia Europe Dance Forum- Pointe to Point organized by the Asia-Europe Foundation (ASEF) in China in 2007. It aimed to explore cultural and artistic distinctiveness through living, playing and creating performance together in an ‘Other’ culture. As such, a group of dance, music and film artists from England, Faroe Islands, Belgium, Malaysia and China came together to do just that. Though the artists were familiar with each other’s work, they had never collaborated before. Between December 2009 and January 2010, they created a residency at Patravadi Theatre in Bangkok and went on field trips around the city. A 5-day exchange was also set up with an independent shadow group in Chang Mai, Wandering Moon Theatre, was set up where they explored an ‘Other’ form. Workshops, sharing sessions and talks with local artists were also organised so that the artists could grow as a group through this range of activities. The Bow Project differed from other cross cultural exchange projects in a number of ways. Firstly, the Bow Project was conceived, developed, delivered and managed by the artist group for the artist group. It was designed by artists for artists to work together. Creating a collaborative work in all areas of the project was central to its success. This empowered the artists to bring out their independent, artistic, technical, logistical and entrepreneurial skills – skills that are fundamental to being a 21st century artist. Because of the daily interactions during the project, the artists’ development was honed artistically and culturally. This significantly contributed to their understanding of culturally derived processes and ideas. The artists wanted to embrace the range of experiences which feature in their lives and influence their work, and then share it. Secondly, the broad scope of the project itself differed from other cross cultural exchange projects. There were three media and five cultural ambassadors. These components would fold inwards to create a central spine which became the Bow Project. 1. A live performance of the product resulting from the exchange process. It was immediate and embodied a direct response to what the artists had done together. 2. A Dance Film, which would serve as a reflection upon both the process and the product, with the additional layers of distance in both time and space. The layers of reflection during the artist exchange, developing studio work, the staged work and the group’s experience in Thailand became part of a layering process – setting down memory over time. The idea of embracing distance and its gradual increase as a way to re-imagine the layers of experience was initiated by the Point to Point Dance Forum in China. There, the group of artists flew in to Beijing to meet for the first time and immediately shared each other’s work. As friends, they visited with the Miao minority in Guizhou. As colleagues, they worked in studios in Beijing. However, when they transcribed their experiences, they did so independently and their quiet reflection gave birth to a documentary film. These layers of experiences were organised through memory, over two years. Through the Bow project, the idea was to embrace the range of differences and similarities that were ‘noticed’ in China in 2007, and then build these observations into contexts and contents. A key feature of the Bow Project was working as a team in all areas and finding ways to work together both inside and outside of the creative space. In Thailand, an opportunity was created to build something together, influenced by this time and space together. Point to Point China provided a strong base to build from. The extended collective memory of this exchange project underpinned the work in Bangkok and felt like a concrete addition of it, a full realisation of the landscape of ideas and possibilities and the rich mix for absorption. What united the group was the discipline and commitment to creativity. The desire to put the process first, beyond each individual, allowed the group to be influenced and to consider what happens to ideas as they are translated and interpreted through another culture or medium. The Bow Project encouraged a level of commitment to a process which was about discovering a central point where all could meet, without pre-planned pathways or pre-conceived vision. After all, this is often how artists work, without linearity. This is reflected in ASEF’s mission to create ‘process based platforms’. As the project developed in Bangkok, the artists shared ideas, approaches, exercises and began to build an array of materials through the understanding of their own and each other’s understanding of ‘bow’. The artists grew in their knowledge of each other’s habits and preferences and negotiated these areas with increasing fruitfulness. They extracted elements of ideas and combined them with others. They freed concepts and compositional materials from their original source to move fluidly amongst the group. Workshop components were designed where each could share and learn from the other. The intensity of the project necessitated a real trust in the strength of the group. There was no leader but a broad recognition of each other’s skills to operate as springboards in the short time. The combined energies offered a kind of hotbed from which ideas grew. Film, music and dance weaved in and out of the mix for translation and interpretation. The artists explored when to hold on, when to let go; what to pass on and when to let the structures live outside of them to find resonances without fear for a final resolution. They shared knowledge of practitioners from their own cultures and the dancers developed increasingly structured improvisations. For example, Manu wrote new music and adapted previous themes while Rannva collected images and explored filming and editing techniques. Each strand locked into another, constructing a web to bounce possibilities out of. The incredible open mindedness of artists was fascinating. This allowed them to share and absorb. Creating a web of ideas and materials did not take long. Shaping them was an organic process in which they negotiated each others’ trends, habits and aesthetic concerns. New pathways emerged during this process and they bravely allowed ideas to float up like clouds and pass, or be pinned back to the ground, rotated and examined like a prism allowing energies to illuminate unimagined possibilities. The artists learnt how to trust and be patient with each other. This made them participants in the ritual of making, rather than coordinators of it. They noticed their own habits and patterns in the light of others and recognised them from another viewpoint. It is hoped that the Bow Project would continue through another residency session, perhaps in January 2011. The plan now is to respond, individually, to what the artists ‘think’ they have made - from their own cultural perspective and artistic position and to develop ‘it’ from there. The artists hope to identify support for this continuing work through the Dance Film which will be distributed widely. Without the support of ASEF, this project would quite simply not be possible. The seed funding enabled the artists to raise further funds for the residency and to offer the performances, workshops and dialogues at no cost. They were free to exchange through the currency of the artist. Rannvá Káradóttir ( Denmark) is a Faroese visual dance artist based in Copenhagen and London. Since graduating from London Contemporary Dance School in 2004, she has been working in England, Germany, Canada, Denmark and her home country Faroe Islands. Projects to date include stage works, dance-film, improvised performances, site specific pieces and integrated video and installations. Rannva is currently taking an MA in Performance Design at London University of Arts, Central Saint Martins. Her latest dance short film, Memotekid, was made in collaboration with visual artist Marianna Mørkøre, and is currently been screened internationally. Cathy Seago (UK) is the director of the interdisciplinary dance company Evolving Motion, receiving awards in support of choreographic research and performance since 1998 in the UK, the US and Southeast Asia. Evolving Motion have been Resident Artists at the Kuala Lumpur Performing Arts Centre, Malaysia (09), The Blue Elephant Theatre London (08), ODT Singapore (07). Recent works have toured in the South East of England and London, Edinburgh, Paris, Taiwan and Singapore. Cathy Seago is a Lecturer in Choreography and Dance at The University of Winchester. Mei-Yin Ng (Malaysia) was born in Malayia. She moved to NYC and studied primarily at the Merce Cunningham Studio, Trisha Brown Studio, and Movement Research. She has worked with the contemporary theatre group Remote Control Productions/ Michael Laub, touring in the 1996-97 production “Planet Lulu” in major festivals throughout Europe and Scandinavia. She founded MEI-BE WHATever in 2002 as a collective field for collaboration and experimentation of contemporary technologies and movement, MEI-BE WHatever has presented work at festivals, museum and theatres around US and Internationally. Ms. Ng has received commissioned from the Merseyside Dance Initiative in Liverpool and Dance New Amsterdam in NYC. She was a selected participant in the 2004 Multimedia Forum of the Monaco Dance Forum, the 2007 5th Pointe to Point Asia- Europe Dance Forum, an artist-in-residence at the Tribeca Performing Arts Center (2006-07) and Dance New Amsterdam ( 2009-10), recipient of a 2009 New York State Council on the Arts Individual Artist Program, New York Foundation for the Arts 2004 Choreography Fellowship and 2009 Individual Artist Fellowship. Emmanuel Baily (Belgium) earned a first prize at the Conservatoire Royal de Musique of Liège in classical guitar and continued through a postgraduate diploma. He obtained a degree in Chamber music. He works as a composer, improviser, performer and teacher with a range of genres and musical groups in Liège, Brussels,etc. and has worked as a puppeteer at the Toon Theatre. He plays regular concerts with groups which include Adam’s Dream, Bathyscaphe II, Bay Lee Quartet. He also founded the Wang Wei Quartet in 2006, which integrated Cambodian Hip Hop dancer Yiphun Chiem in December 2008. Emmanuel’s work focuses on building a bridge to unite ancient western music with the infinite subtleties of movement within the Chinese poetic language.